Autumn is in full swing here on the Central Coast and it is even feeling a tad wintery in our gully, but I am always up for a chicken salad. The thought of roasting feijoas with these warming spices and drizzling it all with creme fraiche sounds like just the ticket for a light lunch. This recipe comes from Amanda Laird, who writes regularly for the New Zealand Herald. She gets quite excited about feijoa season and has a number of other scrumptious sounding recipes on the New Zealand Herald site. Preheat oven to 200°C. 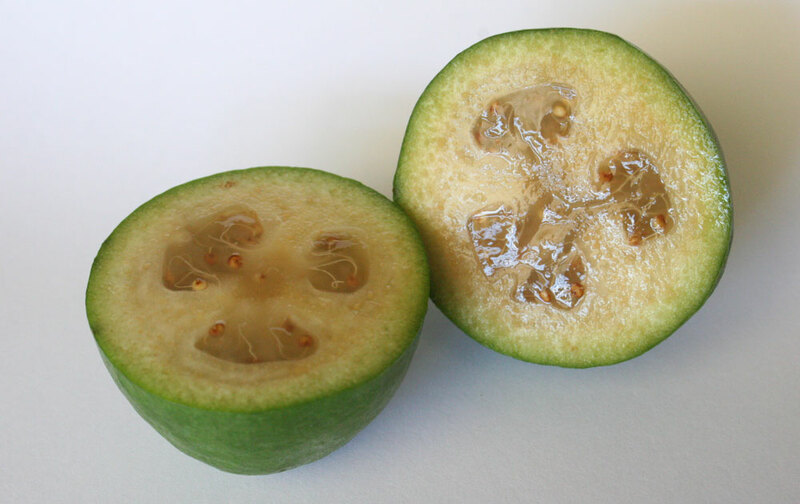 Peel and slice the feijoas. Pour over a tablespoon of oil then using your hands, mix with the cumin seeds and sweet chilli sauce. Bake for 15-20 minutes or until sticky and golden. Rub the chicken with 1 tablespoon of oil and the garam masala. Season and roast for 15-20 minutes: the breasts will take a little longer than the thighs. Break up the dates and remove the stones. Slice the chicken and plate with the leaves, feijoas and creme fraiche.